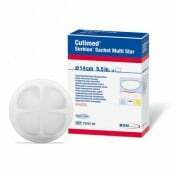 Cutimed® Sorbion® Sana Multi Star Dressing 7323803 by BSN Medical is a highly flexible 7-inch diameter dressing to easily wrap around an elbow, chest wall, heel or sacrum to protect a wound. 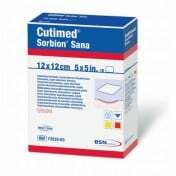 The Sana line of Sorbion dressing means that's it's going to be extra gentle to the wound bed when it's removed. 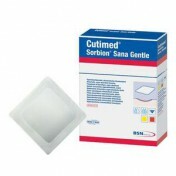 The Sana line is also an ideal dressing to use when wound bed is in varying degrees of healing. 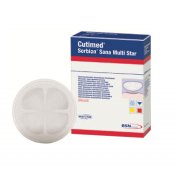 The Sana Multi Star envelope is made with a three-dimensional design to minimize contact area which is helpful to patients with contact sensitivity. 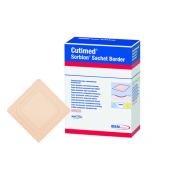 The dressing is also highly absorbent and is classified as a Super Absorbent Dressing due to BSN's Hydration Response Technology devised of mechanically modified cellulose fibers and gel-forming polymers. This creates effective absorption without worry of breakage. 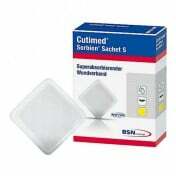 It traps in bacteria and maintains a moist wound environment to prevent wound maceration. This allows for quicker healing. The dressing can even protect the wound for up to four days to be a very cost-effective approach as well. Sorbion® Sana Multi Star 7-inch dressings come in a box of 10. When needing a dressing for smaller wound regions you may want to try this dressing in 4.5 Inch.